Looking for a way to keep your issues of True Detective magazine together, in order and in good condition? A solution that turns them from monthly magazines into a permanent work of reference and a storehouse of stories you can re-read and enjoy, time and again? 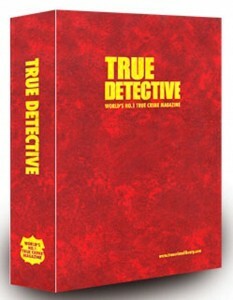 Look no further – because the brand-new True Detective binders have arrived! For the first time in years we are offering handsome, sturdy binders to store your treasured magazines. Newly designed in an elegant red leather-effect with the True Detective logo gold-blocked on the front and spine, each one holds a year’s worth of issues. They’ll look great on your bookshelf! So what are you waiting for? Order yours today!